What makes a good barn for home conversion purposes? Many folks ask me what are the qualities to look for in an antique barn frame when you want to build a barn and particularly a barn-home conversion. This is a very good question as there are many differences in barn frames, they are not all alike. We realize that every project is unique and may require different kinds of barns with many different components. ~ Proper foot print size for your square footage requirements. Typically 1/3 to 1/2 of the first floor space will be cathedral ceiling, so a 30'x40' barn frame would lend itself to be a 1800 to 2100 sq. ft house, without any other additions. We can help you decide roughly how big of a frame you need in general to accommodate your living space needs, room and floor plan requirements. ~ For home conversions, I prefer English and German barns over Dutch barns, as they usually have much higher side walls, although Dutch barns can be very stunning. This allows for higher ceilings on first floors and still more space for second floor lofts or bedrooms with adequate side wall height for windows or doors. High side walls practically eliminate the need for dormers which many times get added to make second floors work if the side walls of the barn frame are not high enough. Although dormers can be an interesting feature of a barn home, they are labor intensive and expensive. 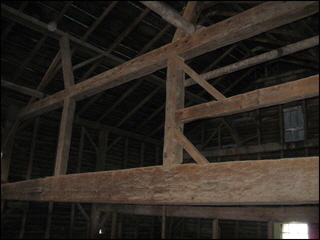 ~ Large purlin system and large tie beams, or double connected tie beams, to help the roof system meet engineering standards, particularly if the barn is over 30’ wide. 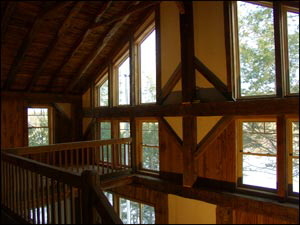 ~ If the barn has double tie beams, it is great if there is enough head room (6'8" by code) to walk between them, particularly if you desire a "cat walk" connecting 2nd floor lofts or an extended balcony and stairs - which are all great features to have in barn homes. ~ Moderate pitched roof (6/12 to 8/12 pitch- my preference) for safety and ease of construction (saves money) and so that the barn does not get too high visually, particularly if you have very high side walls. This may even be necessary so that your home or barn doesn't exceed the overall height restrictions that exist in some parts of the country, such as Jackson Hole, WY. ~ Adequate knee braces (wind bracing) and girts to stiffen the timber frame and provide a more interesting look. Large hand hewn or pole girts can also add a lot of additional charm to the frame. ~ Little rot and damaged or removed timbers to minimize repairs and replacement parts. We bring all our frames back to our shop for general cleaning and repairs before shipping them to your site. Repairs and replacement parts must be done skillfully and with similar material so they become part of the background - invisible so to speak. Of course the better the frame the less this becomes an issue. As much as possible we try to repair the existing timbers of the barn, particularly if they are simply cosmetic issues, as long as they are still structurally sound. ~ I prefer white pine, hemlock, or other soft wood species that tend to be more stable and easier to work with. My favorite visually is hand hewn white pine. ~ Have some interesting and impressive special features like a "swing beam", large ridge beam, intact ladders in one or more bents, or perhaps some long dovetailed or double- side- by -side knee braces. 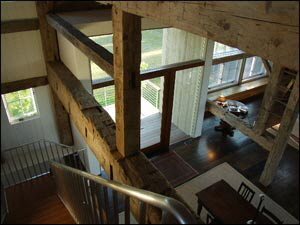 Large swing beams are really special and generally become the main focal point of the entire barn home. We like them so much if we find an otherwise really great frame without a swing beam, we usually get a spare one from a "parts barn" and incorporate it into the frame. This is what we did with our barn home. ~ Large rafters at 2' centers (somewhat rare) for stress panel installation and structure. Typically barns have 3' center rafters. I find hand hewn or pole rafters (small trees hewn flat on one side) add more charm to the roof system as well. If you are going to convert a barn frame into a home, or even build it as a barn, you might as well start with a really spectacular frame. 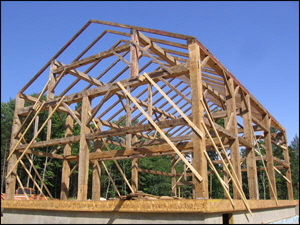 All your labor and materials from the barn frame on will pretty much be the same, and there is a huge difference between an average barn frame - as nice and intriguing as it can be - and a really stunning one. Starting with great barn frame will help significantly in your overall costs, designing possibilities, ease of construction, and of course in your finished home. One of our specialties is finding great barn frames for homes. For more information on how we price our barns and what is included, please click here.